Ensures delivery of needed infrastructure and service. The proposed Transportation Policy Area Review (TPAR) responds to these requests in the following ways. Solutions to deficiencies are based on a forecast of a specific time period rather than by looking at approved projects. The pipeline tells us what projects have been approved, but not when they might be built. Forecasts based on approved master plans use the pipeline as one input, but also account for regional growth projections, the relative distribution of population based on allowed zoning, and economic factors. Auto and transit adequacy standards are determined separately. While PAMR’s single level of service chart that combined auto and transit mobility was convenient, it was difficult for decision makers and stakeholders to understand how roads and transit were each affecting individual policy areas. Individual road segments and transit service routes are examined separately to determine exactly where solutions are needed. As with adequacy standards, separating roads and transit allows customized solutions to the identified problems. The starting point of the analysis is shifted from the capacity of established transportation projects to determining what projects are needed to accommodate master planned growth. This shift focuses on implementing master plan goals and allows timely responses to market opportunities, rather than limiting growth to what can be accommodated by transportation capacity. Specific road and transit solutions are identified within and across policy areas. Specificity makes it easier to schedule and fund projects when and where they are needed. Costs can be estimated and allocated to each policy area and the County Council can set priorities in the County budget. Projects are funded through public-private cost sharing, with tight links to the county and state transportation budgets. Projects can only be postponed, not removed from the CIP. If projects are not privately-publicly funded within 10 years, they move to the CIP or Operating Budget. TPAR’s open and iterative process allows elected officials to make priority decisions. 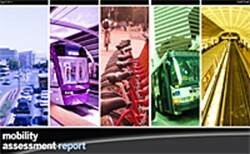 An annual report will monitor both development and transportation projects. Regular and specific reviews by the Planning Board and County Council as part of the master planning and budget process will ensure projects are not overlooked and will allow for adjustments to programming and implementing transportation solutions. Regular and specific reviews by the Planning Board and County Council as part of the master planning and budget process will ensure projects are not overlooked and will allow for adjustments to programming and implementing transportation solutions.